John McCain, looking through a crystal ball to 2013 and the end of a prospective first term, sees "spasmodic" but reduced violence in Iraq and Afghanistan, Osama bin Laden dead or captured and government spending curbed by his ready veto pen. Outlining his vision for Iraq, McCain said that "by January 2013, America has welcomed home most of the servicemen and women who have sacrificed terribly so that America might be secure in her freedom." "The Iraq war has been won," McCain said, anticipating a key achievement of his administration. "Iraq is a functioning democracy, although still suffering from the lingering effects of decades of tyranny and centuries of sectarian tension. Violence still occurs, but it is spasmodic and much reduced." "The United States maintains a military presence there, but a much smaller one, and it does not play a direct combat role," he added. Speaking to reporters afterward, McCain denied that by saying the war would be won by 2013 he was setting a timetable for U.S. withdrawal from Iraq something he has criticized former rival Mitt Romney for doing. "It's not a timetable, it's victory, it's victory I've always predicted," McCain said. "I'm not putting a date on it. It could be next month, it could be next year, it could be three years from now." "McCain's vision of a victory in Iraq and the return home of most U.S. troops by 2013 is much different than that painted by the Democratic Party for a McCain presidency," notes CBSNews.com senior political editor Vaughn Ververs. "After weeks of being pounded for saying he'd be comfortable with a U.S. presence in Iraq for '100 years,' McCain is clearly trying to adjust those perceptions." Democrats challenged McCain's comments, led by presidential contender Hillary Rodham Clinton. In a statement, the New York senator dismissed McCain and said he "promises more of the same Bush policies that have weakened our military, our national security and our standing in the world." The Barack Obama campaign said that while the candidate agrees with some of McCain's sentiments, "you cannot embrace the destructive policies and divisive political tactics of George Bush and still offer yourself as a candidate of healing and change." On domestic issues, the Republican presidential contender also envisions April's annual IRS angst replaced by a simpler flat tax; illegal immigrants living humanely under a temporary worker program; and political partisanship stemmed by weekly news conferences and British-style question periods with joint meetings of Congress. McCain concedes he cannot make the changes alone, but he wants to outline a specific governing style to show the accomplishments it can achieve. "I'm not interested in partisanship that serves no other purpose than to gain a temporary advantage over our opponents. This mindless, paralyzing rancor must come to an end. We belong to different parties, not different countries," McCain said in the capital city of Ohio, a general election battleground. "There is a time to campaign, and a time to govern. If I'm elected president, the era of the permanent campaign will end; the era of problem solving will begin." To the disdain of some fellow Republicans, the presumed GOP nominee has worked with Democrats on legislation aimed at overhauling campaign finance regulations, redrafting immigration rules and regulations and implementing government spending controls. While that has cultivated a maverick image for McCain, the Arizona senator has also been accused of exhibiting a nasty temper - swearing even at fellow lawmakers from his own party - and unabashed partisanship. 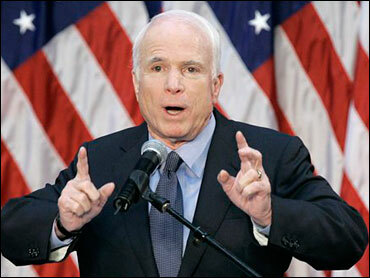 In particular, McCain has clashed with the leading Democratic presidential contender, Barack Obama. After tangling with the Illinois senator on lobbying reforms, McCain questioned Obama's integrity in a publicly released 2006 letter. McCain wrote he had thought Obama's interest in ethics legislation "was genuine and admirable," before adding: "Thank you for disabusing me of such notions." He accused Obama of "partisan posturing." While calling for Congress to drop mindless partisanship, McCain also chided the media - with whom he has enjoyed a generally positive relationship - for fueling contention with its campaign coverage. "Campaigns and the media collaborated as architects of the modern presidential campaign, and we deserve equal blame for the regret we feel from time to time over its less-than-inspirational features," he said. In outlining potential achievements of a first term, the 71-year-old McCain implicitly was suggesting he would seek a second term, an attempt to mute suggestions he would serve only four years after being the oldest president ever to take office for a first term. The Taliban threat in Afghanistan has been greatly reduced. "The increase in actionable intelligence that the counterinsurgency produced led to the capture or death of Osama bin Laden, and his chief lieutenants," McCain said. "There still has not been a major terrorist attack in the United States since Sept. 11, 2001." A "League of Democracies" has supplanted a failed United Nations to apply sanctions to the Sudanese government and halt genocide in Darfur. The United States has had "several years of robust growth," appropriations bills free of lawmakers' pet projects known as "earmarks," public education improved by charter schools, health care improved by expansion of the private market and an energy crisis stemmed through the start of construction on 20 new nuclear reactors. Democrats are asked to serve in his administration, he holds weekly news conferences and, like the British prime minister, answers questions publicly from lawmakers. McCain also pledges to halt a Bush administration practice of enacting laws with accompanying signing statements that exempt the president from having to enforce parts he finds objectionable. "I will respect the responsibilities the Constitution and the American people have granted Congress," the senator said, "and will, as I often have in the past, work with anyone of either party to get things done for our country."